With more than five years of experience, Brie provides clients with the most up-to-date styles by staying on top of all the latest hair and fashion trends. Professionally trained at Jean Madeline Aveda Institute, Brie specializes in keratin treatments, flattering cuts and beautiful blowouts. 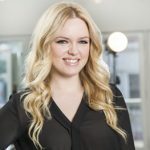 This easy-going, down to earth stylist loves working with any color hair, but especially blondes. She is a perfectionist and takes her time with each client to achieve their desired look. Brie has been with Vanity for five years and can’t imagine working anywhere else!